GOSHEN—The killing of five police officers during a civil protest last week took place in Dallas, but it was felt all around the country, and Orange County was no exception. 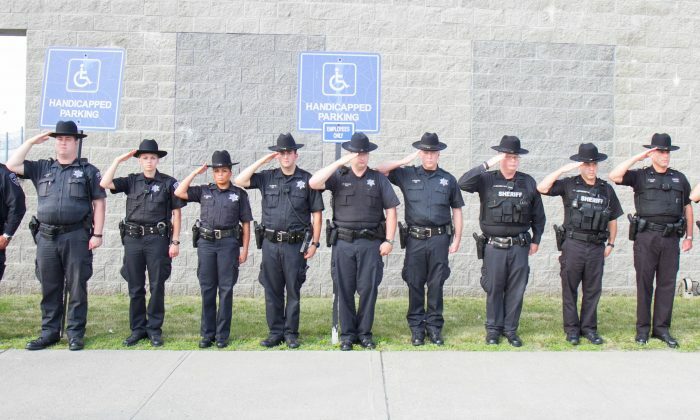 At a vigil for the fallen officers organized by the sheriff’s office on July 12, several in law enforcement said they felt the event was a symbol of the times. Officers are being targeted today. There is no easy solution to the problems law enforcement face, but training helps, said Sheriff Carl DuBois. The two constants in law enforcement are change and training, he said, and a lot of that training has to do with improving communication and character building. The attack on police July 7 was carried out by a lone sniper, Micah Xavier Johnson, 25, of Mesquite, Texas, a military veteran who served in Afghanistan. He shot at police from a community college building near a civil protest on police brutality, killing five police officers and wounding nine others. He reportedly told police he wanted to kill white people. Police eventually stopped Johnson by detonating an explosive that killed him. District Attorney David Hoovler encouraged people to stop by the memorial in front of the county courthouse in Goshen, which honors over 25 county police officers who have died in the line of duty. One retired police officer chose to pay his respects to the fallen officers by running from his home in Middletown to the memorial, 6.2 miles away. “It’s a show of strength for Dallas,” said runner Anthony Lucarelli who retired from the Middletown Police Department in 2000.